Online Shopping is now not only for Fashion and Groceries but also for medicines. 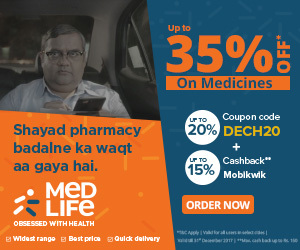 For people in India, You can purchase Medicines online in India and get discounts up to 40% using top Medicine Suppliers online such as Medlife. 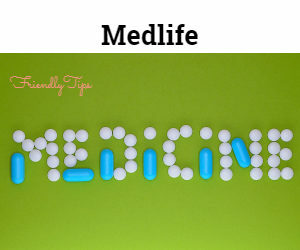 This FriendlyTips article is about Medlife App Review and how you can save money purchasing medicines online in India. Medlife is one of the top medicine providers online. You can now easily purchase medicines online in India and get them delivered at your home within two to three working days. Below are the steps to do it and earn upto 40% off on your medicine purchase online. 1. Inorder to order medicine online with Medlife, you need to have an account with Medlife. To get started, open your Medlife Account. You need a gmail account and password for opening account. 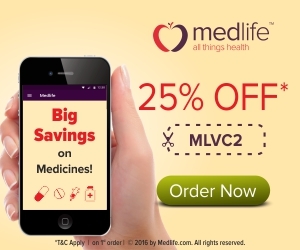 Use our Medlife coupon KSASHHD to get 30% off on your first order. Once you open your account and have an username and password, you are get set to go to second step. 2. Login to Medlife App with the banner link below. You will be redirected to Medlife Login. Enter with your username and password. 3. Upload your doctor prescription to the website. Once you upload you are ready to order. 4. Search for your medicines in Medlife app and add your medicines. Checkout once you finished adding all medicines. 5. Add Medlife Coupon Code KSASHHD for your first order. Place the order. 6. Once your order is confirmed, you will receive and SMS from MEDLIFE. Pay online with Mobikwik and get additional 15% off upto Rs.150. Get a total discount upto 40$ off for your medicine order online. Share your experience in using this Medlife APP.